About The Robert Parker Stadium The ground was opened in 1986, although most of the developments followed later. The Main Stand, pictured right, was opened in 1998 and has been expanded from it’s original capacity of 100 to now seat 150, while the opposite side boasts two covered areas. These were constructed in 2006 to replace a much simpler covered standing area that straddled the halfway line. These two covered terraces had only been in operation for one season before the nearest to the entrance had 100 seats fitted to it in the Summer of 2007 in order to meet ground grading requirements. This Stand is shown in the picture below left. 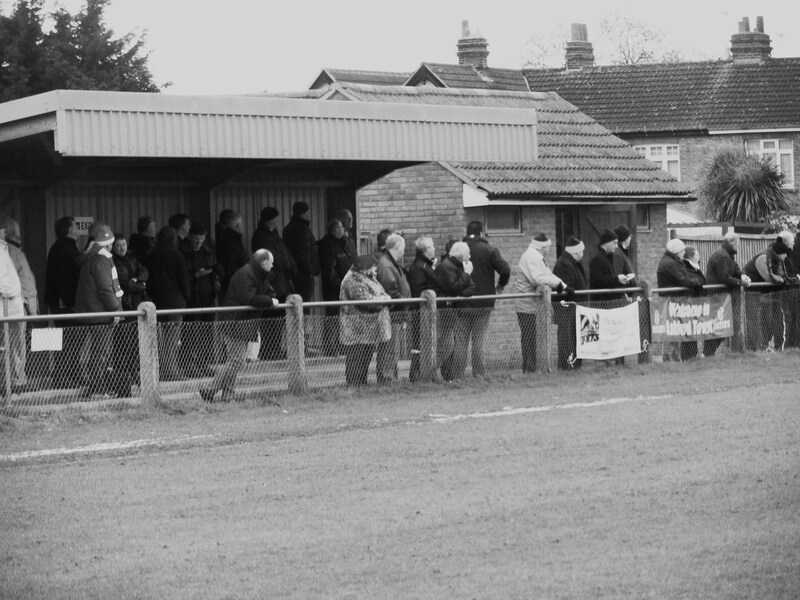 When this stand was fitted with seats, the original brick built dugouts were demolished and new, larger perspex dugouts were sited either side of the Main Stand. The Away Team bench is more or less directly opposite where the old benches were. Again, this was carried out in order to meet FA regulations, which state that both benches must be an equal distance from the halfway line. All covered areas offer column-free viewing. There is no cover behind either goal, although the Short Lane End does have four steps of terracing. The Fuel Plant End (nearest the entrance) is very narrow, although there is hard standing and just enough room for one row of fans to watch the game. The Tea Bar, stocking all the usual hot food and drinks, is just inside the entrance and is competitively priced. Meanwhile, the pitch has received significant investment and is now among the better surfaces in the division. The clubhouse is outside the stadium and is fairly small. A refurbishment was carried out in the first quarter of 2008 and there is now a pool table. The beer range will always include John Smith’s Cask and / or London Pride, with Guest Ales sometimes available. We also serve Foster’s, Guinness, Strongbow and Courage Best on draught, as well as a range of bottled beers and soft drinks. All are expertly served by Bodge and Tory, our lovely matchday bar team. Above details kindly provided by the club. How to get to the Robert Parker Stadium If you are coming from the M25 take junction 13 and join A30 towards London. Stay on A30 through Crooked Billet Roundabout towards Ashford Hospital. After passing hospital at large crossroads, stay on A30 and take the 3rd left hand turn by a blue footbridge over the road into Short Lane. Ground is signposted from main road. Ground is about quarter of a mile on the right hand side. (signposted) Alternatively, from the Kingston area, head towards Sunbury on A308. At Sunbury Cross roundabout, take 3rd exit towards Staines, still on A308. Turn right at third cross roads onto School Road (B378). Stay on B378 over next major cross road and proceed to roundabout. Take 2nd exit onto Clockhouse Lane. At top of road, turn left at roundabout onto the A30 towards Staines. After approx half mile, turn right into Short Lane by bearing left into slip road at footbridge and then turning back on yourself. Ground is about quarter of a mile on the right hand side (signposted). If you are coming by train, Ashford BR station is over two miles away. A walk from the station will take approx. 20 to 25 mins. Taxis are available near the station (approx. fare £5.50 – £6.00). Alternatively, the 555/557 services towards Heathrow can be caught from the town centre, which is a short walk away. Alight at Long Lane and then follow the directions from Long Lane as shown below. You can also reach the ground by tube. Hatton Cross on the Piccadilly line is the nearest tube station. Take the 203 bus towards Staines from Stand D or 555 (Walton on Thames) or 557 (Addlestone) from Stand E. Whichever you catch (services are quite frequent), alight at Long Lane, Stanwell. Walk down Long Lane, past the Three Crowns pub, until you see Short Lane on your left. Proceed along Short Lane and the ground will appear on your left. Admission to The Robert Parker Stadium £8 for adults, £5 for OAP’s and £2 for under 16’s. Programmes are available inside at £2. Our Last visit – December 2010 Last week it was mental in London. Snow like we have never seen it before – well since February actually, but the doom mongers will have you believe it is all to do with global warming, rather than of course just unseasonal weather. And of course the whole country ground to a halt. Sitting in Denmark watching these events unfold was quite amusing. It started snowing here on the 18th November and hasn’t stopped yet. Temperatures dropped into the minus double figures during the day, but as you will have seen from my report from Randers last week, football goes on unaffected by the cold weather. In fact since the snow started some three weeks ago not a single game has been postponed out here. I headed home early on Tuesday to find that virtually all forms of transport had ceased to operate, and despite living just ten miles from the centre of London I was not able to travel into work due to the incompetence of a rail company (for a view on my trials and tribulations at the hands of SouthEastern click here). Thursday saw temperatures drop to a new low and there seemed little chance that anything would improve for the weekend, and thus football. Originally I was going “up north”. CMF was due to visit her parents, and as I needed to head off very early Sunday back to Denners to play Father Christmas at the staff family party I had a free day. I had originally pencilled in a trip to Buxton or Leek Town, new venues both in wonderful locations. But it soon became obvious that I would be lucky to see any game. By mid day Friday nearly 75% of the games being played in the top 4 levels of the Non Leagues had been called off. By 9pm that had risen to 90%. Every game in the Blue Square Conference, South (bar Maidenhead), North and Evostick Northern Leagues had been cancelled. And then the temperature started to rise. By 9am on Saturday morning the snow was rapidly melting in SE9 and there would have been some egg on the faces of a lot of these clubs who were far too hasty in cancelling their games. Once a game has been deemed as postponed it cannot be “unpostponed” and has to be rearranged within 42 days. But quite why they couldn’t have simply moved the games to Sunday when the weather improvements would have meant virtually every game was playable I don’t know. I scanned the options I had. Wealdstone was on in the Rymans League Premier, as too was Ramsgate FC. I had a last minute offer Dave the Coach of a free ticket in the Scunthorpe end at Millwall (he is called Dave the coach as he drives the team coach) but even though they play in claret and blue and go by the nickname “The Iron” I wasn’t tempted. 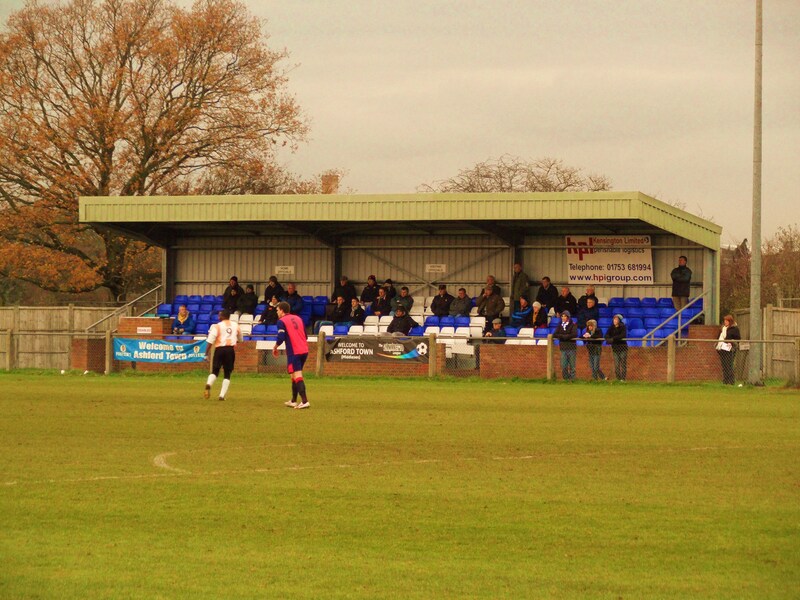 But as I was due to get my head down at Heathrow one game did catch my eye – Ashford Town. Sorry, I should add Ashford Town (Middlesex). Officially the only club in Great Britain that include brackets in its team name (some have it in the club name to represent a reformation date for instance). The reason being is that there is another Ashford Town, based in Ashford Kent. Confusion used to reign when both played in the Ryman Leagues in past years although quite why they didn’t toss a coin to determine who would be Town and who would have a new name like Synthonia or Volcanoes I do not know. This Ashford sit almost next to the perimeter fence at Heathrow Airport, slap bang next to where they keep the jet fuel in storage tanks at the Robert Parker Stadium. I set off in the slush around the M25 still wondering if the Zamaretto League website was wrong and the game was actually off, but then the power of Twitter came to the fore again as a direct message reached me simply saying “It’s on!”. An hour later I pulled up outside the ground, unable to get into the car park. Word had obviously travelled as desperate men who need their fix of football had headed to the only one of two non league games on within the M25 (Wealdstone was the other). And there wasn’t a patch of snow in sight! Ashford have had a rollercoaster ride of the last few years. After promotion to the Isthmian Premier League in 2006 they won the League Cup and the County Cup in the next couple of seasons. But things were not going too well off the pitch. After finishing in the relegation places last season they suddenly found themselves bumped into the Zamaretto Central division where in theory more local derbies against the likes of Uxbridge, Northwood and Hayes would cut down on travel costs but also increase gate money. Today’s game was a prime example. Visitors Slough Town have themselves been homeless for a few years but the “Rebels” as they are known always travel with a fair few for a non league side. It also promised to be a decent game with both teams challenging for a play off spot. Ashford Town (Middlesex) 1 Slough Town 2 – Robert Parker Stadium – Saturday 4th December 2010 Picking up a programme as I entered the ground I noticed a couple of familiar names in the Ashford squad. Player/manager for the Tangerines is Jamie Lawrence, the ex-Jamaican international who it’s rumoured gave Jason Lee the idea for the pineapple hairstyle. Also in the squad was ex-Arsenal youngster Isaiah Rankin who was one of the players tipped by Wenger to go onto great things from his youth set up. In the Slough side was an interesting character with goalkeeper Dominique Jean-Zéphirin, on loan from Farnborough, is a Haitian international. You certainly do not see many of those in the lower leagues! With not a patch of snow in sight and a pitch that was completely playable we had a match on. The club should take massive credit for this, both in terms of clearing the pitch in the first place but then insisting that any decision was made as late as possible. Two contrasting styles of play made this game incredibly open from the first whistle. Ashford, with Jamie Lawrence still full of energy played a nice pass and move game whilst Slough played on the counter attack. Chances fell at both ends before the deadlock was broken by Slough’s Steve Sinclair. Ashford’s young keeper Jack Franks had a torrid first half in front of the vocal Rebels fans, fumbling a couple of shots, prompting the Slough players to start shouting “Shoot on sight”, perhaps getting a bit carried away with the razor wire around the edge of the ground but it worked as Sinclair’s shot was fumbled by Franks into the net. The young lad looked despondent but unlike Robert Green in South Africa the Ashford players rallied around him and he had a blinder for the rest of the half, pulling off a couple of fantastic saves. He was powerless to stop the second after a corner fell to that man Sinclair again on the edge of the box and he calmly lobbed the ball into the top corner of the net. The goal quite rightly brought the Slough bench to its feet but the linesman wasn’t happy about that. “Two standing” he kept saying, pointing to the bench as if they were ever going to take notice of him. Half time came and went, and despite a noticeable drop in temperature only one player wore gloves, and there wasn’t a snood in sight. Slough kept up the tempo, still trying to chance their arm from distance, hoping that they could beat Franks. They came close a couple of times, hitting the woodwork twice, but as the game wore on it was the home side came back into it. Slough lived on the edge as the game wore on and Bill Jeffreys moved up front to give them another option. They got their just reward with five minutes to go as Tyrone Berry raced onto a through ball and scored. Queue the usual chaos that goes with a search for a late equaliser including the time wasting in the corner, hoofed balls out of the ground and play acting by the Slough players. But it was to no avail. Slough held on to record the win. Walking out of the ground with the other 200+ fans I got the feeling that many would not have been here if it wasn’t for postponements everywhere else. But it still begs the question if Ashford could play then why couldn’t bigger sides further up the league. My theory, and shoot me down in flames on this one, is that clubs are pressured by the Leagues to make these decisions despite their better judgement. And that is what is wrong with football today. The game is being taken over by the administrators with scant respect for the fans, the players or the clubs. More pictures from the game can be found on our Flickr channel here.